Tony's mobile number is 801-541-8806. Can't talk right now? Send him an email below. What is a Buyer's Realtor in Utah? A buyer's Realtor works exclusively for the buyer. A buyer's Realtor helps you assess the market value of a house, suggests necessary repairs or improvements, helps you negotiate a best price, follows through with contract contingencies, coordinates showings on multiple homes, and will share professional knowledge of different areas or home types and styles. A buyer's Realtor can help you assess the current real estate market in hyperlocal neighborhoods and provide you with information so you can make informed decisions. What is a Seller's Realtor® in Utah? A seller's Realtor is an agent that works exclusively for the seller. The seller's Realtor is obligated to work in the seller's best interest only. By law, he or she must disclose to the seller anything a buyer says or does that can help the seller get the best price and terms on the sale of their home. They must also do everything possible to get the best price for the seller (not the buyer). While it is possible in Utah for a Realtor to work as a limited agent (working for both the seller and the buyer at the same time), we discourage the practice. When something goes wrong, you'll want an agent and real estate brokerage that is 100% on your side by having your own Realtor®. And in most cases, having your own buyer's agent won't cost you anything. Exclusive representation - we never represent the buyer, only you. Loyalty - During negotiations, we're 100% on your side. Visibility - Get your home found in more places, 24/7. Time management - We'll manage all deadlines and timing for you. Network - Sometimes it's not only what you know, but who you know. Comparables - See actual sold prices of homes in your neighborhood. 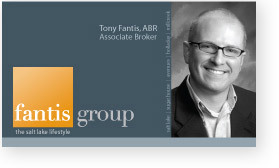 Tony Fantis has been helping buyers and sellers in Salt Lake City and Park City, Utah for 13 years as a full time Realtor. He is licensed as the principl broker of Fantis Group Real Estate, a full service boutique real estate brokerage located in Sugar House near Sugar House Park. 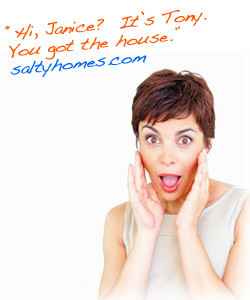 Saltyhomes.com is provided completely free as a service to buyers and sellers relocating in the greater Salt Lake City and Park City, Utah areas. Come see why people buy real estate around a big, salty lake!